Clearly the value-based purchasing incentives initiated by the Centers for Medicare & Medicaid Services (CMS) prior to 2010 and adjusted over the years are having their intended affect. As an example, earlier this decade we used to discuss that close to 100,000 deaths were reported each year from hospital-acquired infections (HAIs) alone. A few years ago, the estimate was closer to 80,000 annual deaths, and is continuing to trend down. The good news (great news, actually), is that all of the hard work put in by hospital staff and the medical industry is moving things in the right direction and saving lives. The fact that the movement began based on monetary values rather than human values of savings lives can be debated, but the impact cannot. The bad news, however, is that there is still much work to be done. The percentage declines in HACs are impressive, but the incidence rates are still very high. 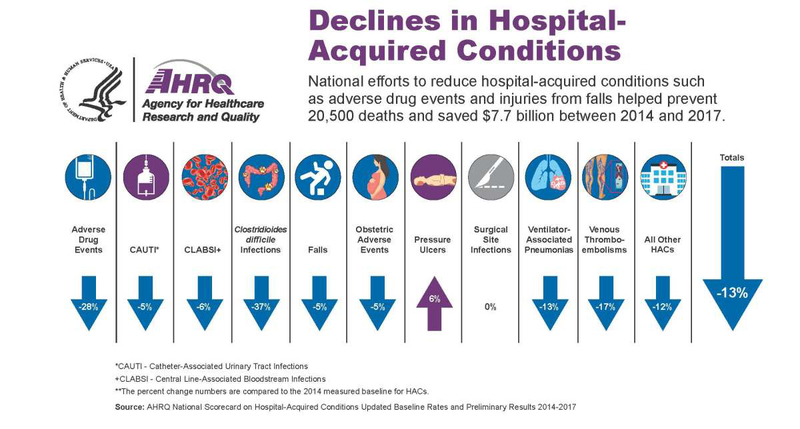 For instance, the last time AHRQ released a similar report (in 2016), the 2014 incidence rate was 99 HACs per 1,000 hospital discharges and equated to approximately 2,940,000 HACs among all hospital inpatients 18 years old and over. The data reported in this year's report put that rate estimated at 86 HACs per 1,000 discharges for 2017, or approximately 2,550,000 HACs. Also concerning is that two HAC categories did not decline at all over the past four years - Surgical Site Infections and Pressure Ulcers. Surgical Site Infections (SSIs) had not declined at all since 2014, despite the intentions of targeted safety initiatives such as SCIP (Surgical Care Improvement Project) and CMS' value-based purchasing incentives. CMS' goal is to get overall HAC rates down to just under 80 per 1,000 discharges by the end of 2019, a 20% reduction from the 2014 rate. We won't know the success of that for a few more years. But it is interesting to note that Adverse Drug Events rate has already surpassed it's 2019 goal of 26.9 per 1,000. The 2019 goal of PIs is 17.4, which seems out of reach today. Clearly, a significant catalyst must be brought to bear on the PI rate, and soon.